Get classic Strat sound with modern updates. 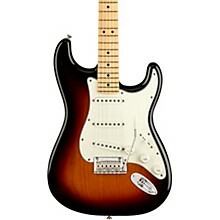 The Fender Player Stratocaster is the most popular Fender Strat model. 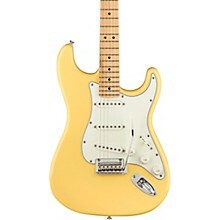 The Player Strat offers several upgrades over its predecessor, the discontinued Fender Standard Stratocaster. Whether you're a professional guitarist looking for an affordable, yet road-worthy workhorse, or you're a very lucky beginner, the Fender Player Strat will deliver full Fender tone and vibe for years to come. Often referred to as the Mexican Stratocaster, the Fender Player Stratocaster with maple fretboard offers incredible value from one of the biggest guitar brands. 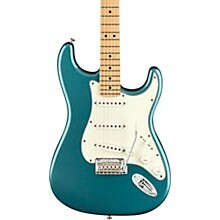 This Mexican Strat model with maple fretboard features three single-coil Fender Player Stratocaster pickups. If you're looking for the HSS version with a humbucker and two single-coil pickups, see the Fender Player Stratocaster HSS with maple fretboard. If you're looking for the HSH configuration with two humbuckers and a single-coil pickup in the middle position, see the Fender Player Stratocaster HSH with maple fretboard. If you're looking for warmer tone and a darker-color fingerboard, you'll find the same pickup variations, SSS, HSS and HSH, available for the Fender Player Stratocaster with pau ferro fretboard. The sound of a Fender Strat has inspired guitar players for decades. The Fender Player Stratocaster with maple fretboard is the most affordable way to add authentic Fender Strat tone to your guitar setup. From the clear high end, through the gut punch of the mids and the solid lows, the sound of the Fender Stratocaster helped define what an electric guitar should be. 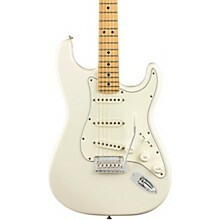 The Fender Player Stratocaster with maple fingerboard is versatile enough to suit every style. This Mexican Strat's tone is broad enough for every player to find an individual voice. This Player Series Stratocaster with maple fingerboard puts all of the classic features of the Strat at your fingertips while adding a modern edge. It offers a modern neck profile, medium-jumbo frets and a freshly redesigned 2-point fulcrum vibrato bridge. With a beautiful gloss finish over a solid alder body, a 22-fret maple fingerboard with a contemporary 9.5-inch radius for easy bending, the Player Series Stratocaster is primed and ready to carry you along your musical voyage. Be sure to check out the complete selection of Fender Player Stratocaster guitars, or the full assortment of Fender Stratocaster guitars available at Musician's Friend. Stake your sonic claim. Order your Player Series Strat now.